I had been off the bike for a couple of weeks due to rain and minor medical issues. It was nice to get another ride toward an R-12 award on November 4th. Jacob Anderson was leading his 204-km Southern Sojourn. The weather was clear but cold at 40-degrees. I figured this was a good chance to try the ride again without the rain. 🙂 It was also a great opportunity to shake down my new handlebar bag, run my lighting system, and to try dressing appropriately before the weather was too cold to manage any clothing selection mistakes. I wore tights, knee warmers, toe warmers, two summer jerseys, arm warmers, and a lightweight jacket. I thought it was too much. But I was initially cold and then warmed up… just the way it’s supposed to work. I won’t get into a lot of detail about this ride since it’s a repeat of my first permanent. I’m going to just touch on the things which were different. My transition from car to bike went much better this time. I had mounted my bike outside the car and didn’t have to use precious time to assemble anything at the starting point. I was already packed and dressed for the ride, too. We had four riders: ride organizer Jacob with experienced randonneurs Keith and Kim. I had heard Keith and Kim are fast. The 18-mph warm-up was a good indicator of that. I was riding with my new Arkel handlebar bag and was packed for a 600-km ride by carrying my rain suit and a few extra clothing items. I wanted to train with the extra weight. The bike was heavier than expected. As a result, I was feeling the effects of the brisk pace right away. I’m slow to warm up and hoped my fatigue would improve. It didn’t. I backed off after about 14 miles. I was certain I’d do the majority of the ride alone. “Train as you’d ride,” right? 😉 Jacob was not up to the 18-mph pace, either. He opted to slow down so we could stay together. I think he could’ve held a faster pace than mine. He was a great host and passively encouraged me by staying behind. We hung out around 16-17 mph. It wasn’t too long before it was time to peel off a layer. I unzipped the sleeves from my jacket. Keith and Kim were nowhere to be seen when we arrived at our next stop. They were gone before we arrived at the lunch stop at the 60 mile mark, too. The plan was to limit our lunch stop to 30 minutes. We were only five minutes late departing. 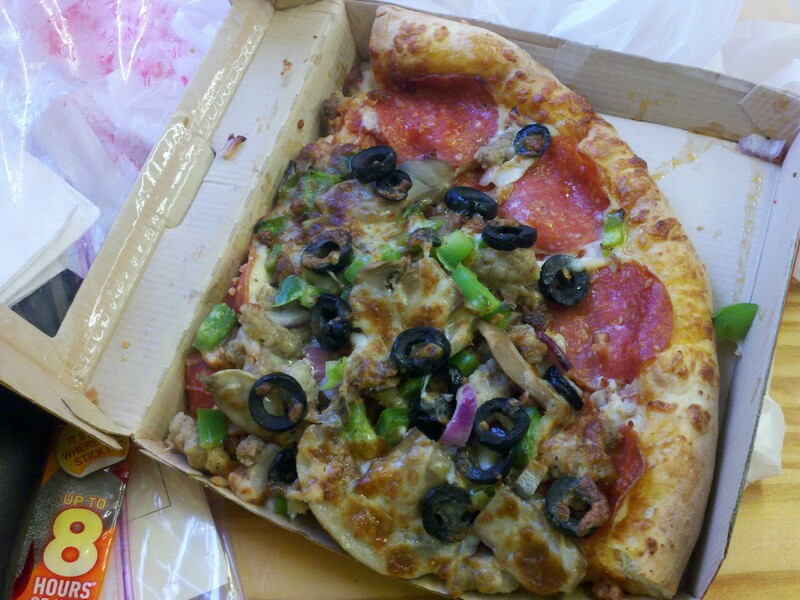 I bought a slice of pizza and then redefined “hand-tossed” by dropping it on the floor. It was quite a mess inside the box. So I ate it with a fork! 🙂 My feet were getting cold. Luckily, I had some chemical warmers to put under my toe warmers. I dreaded the next 40 miles: HEAD WINDS! Although I was staying hydrated better than last month, I still found myself hanging around 14 mph with a few drops to 13. Jacob rode ahead, but remained in sight. We rode together for a few stretches. I found myself unable to stay warm. I was wet from sweating under the jacket. Removing the jacket was no good since my jerseys were wet. It felt WAY colder than 48-degrees! So I donned a slightly heavier jacket. It was not ideal. But there was little else I could try since I was already wet. I was comfortable if I didn’t overwork or overheat. I need to work on my layering technique a bit more. I have wool base layers on my wish list. Waiting for Santa isn’t going to cut it. Therefore, I’ll have them by December’s permanent. We rode the last 30 miles in the dark. I was plenty prepared for that. I wore a reflective vest, reflective ankle bands (both required by RUSA), and reflective wrist bands. 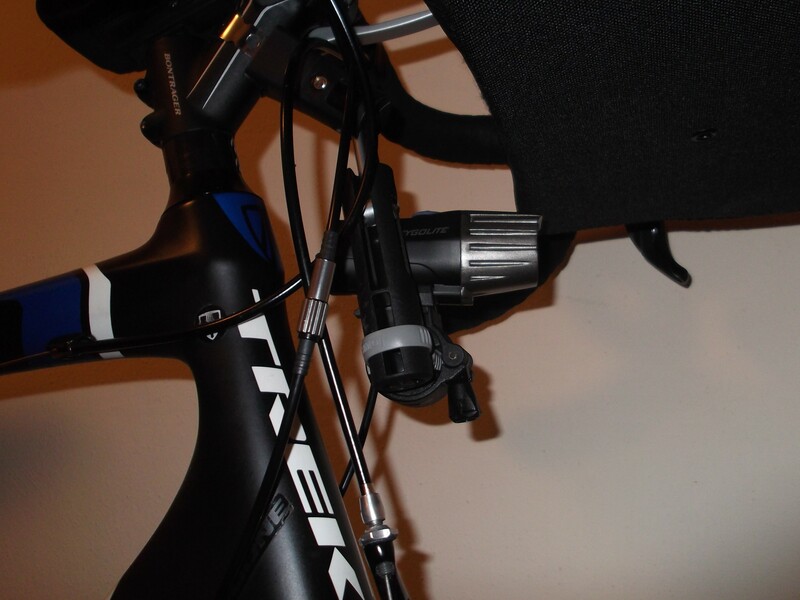 I used a Cygolite Expillion 350 and two flashing tail lights (one on my rear rack and another on my helmet… no riders behind me). I also had a reading light attached to my helmet. My goal was to stand out to drivers. I imagine I was quite visible! The traffic was tolerable and the drivers seemed unusually patient. NO ONE buzzed us, honked, or made unsafe passes. I’m inclined to wonder if the drivers in Chesapeake are more courteous than those in York County or if the reflective apparel compels more respect than riding without it. I’ll find out when I do a few night rides elsewhere. We managed to finish right at 11 hours. That’s slightly slower than my first 204-km ride. I was hoping to be a little less tired than I was last month when I rode in higher winds and rain. But it wasn’t happening. My last 20 miles had me wondering how I could possibly finish a 300-km or longer ride when I felt as sore as I did at less than 200-km. 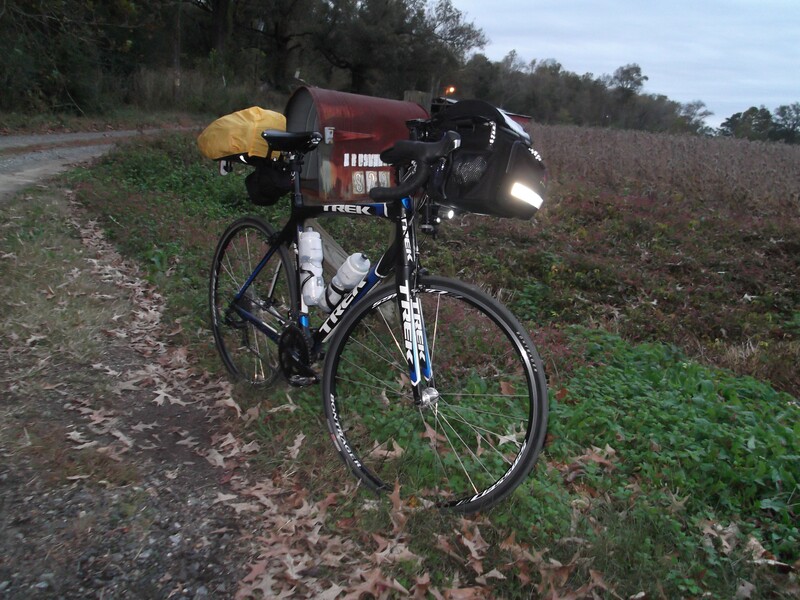 Despite my fatigue, I must say I noticed a big improvement in efficiency with the handlebar bag. Even in the dark with a reading light on my helmet, I was able to open the bag and quickly find snacks while riding. This kept me rolling and fed rather than stopping or ignoring nutritional needs via my stubborn desire to keep moving. It also displayed my cue sheet and even helped with alternate hand positions while riding. 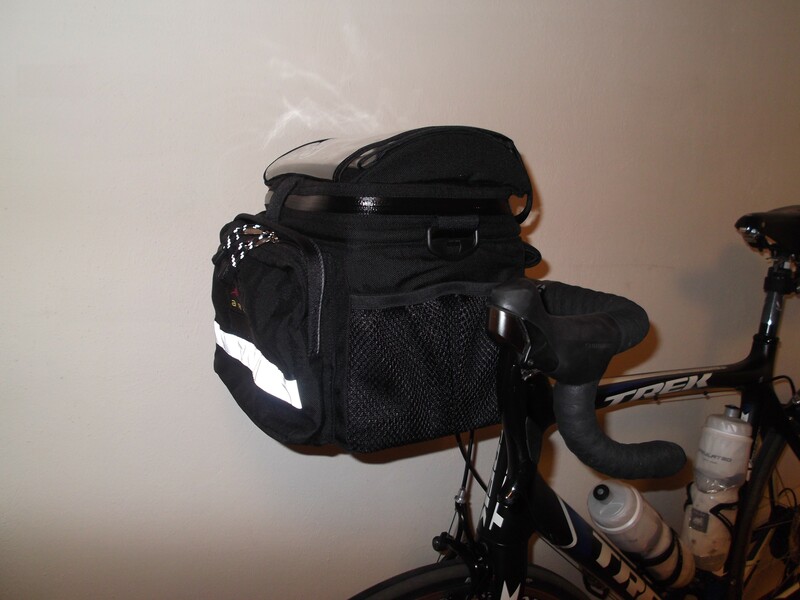 If I were to ride with only one bag, I think I’d choose the handlebar bag over the more common trunk bag. This entry was posted in Permanents (200km+). Bookmark the permalink. Weight matters not on the flat. So over-packing on the routes you’re doing with Jacob matters not. If you come down and do certain of the Raleigh are permanents, and certainly if you do Alan’s 300 and 400 brevets, you’ll find there is a price to be paid for over-packing. That noted, I almost always carry 4 bottles, even in the chilly months, even when I’m pretty sure 1 bottle would be enough — it is amazing how often others run out of water. What terminology basis are you using? I see that you’ve done two Permanents. Darn few Americans would refer to a Permanent as a “Brevet” or even a “brevet”. I’ve never heard anyone refer to a Permanent as a “randonee”, which is what most of the English-speaking world calls what Americans usually refer to as a “brevet” — i.e., “calendared-event”. I could be wrong, though. 3. there was something else, but I forget. Even though they are not bike specific (and therefore a little more reasonably priced) I have been using Duofold long johns. They are tagless, and flat seamed for comfort, and you want the style (Originals, Mid Weight) that uses a Merino wool layer with a polyester layer (not all do). Available on Amazon. They will get damp to wet under a rain shell, but the wool retains a lot of warmth even when wet. I normally wear a longsleeve tech tee under the top just in case it gets warm enough to strip off, but just UnderArmor shorts under the bottoms, then a shell over both. You will still be sweaty after a hard ride, but you’ll still be warm!